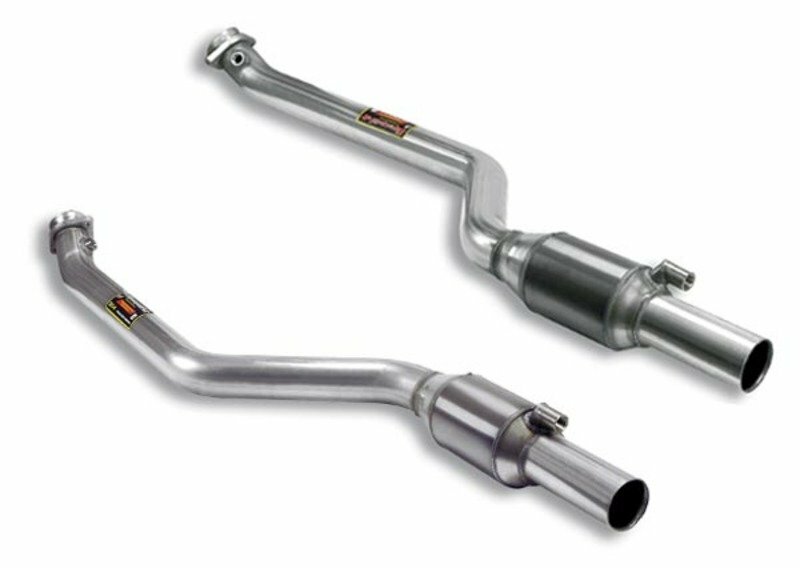 E9X M3 Supersprint Sport Catalytic Converters with Test Pipes are designed to replace the stock primary and secondary catalytic converters with high flow sport cats. With eliminating one set of cats and enlarging the piping the improved flow will increase performance and throttle response as well as increase sound and reduce weight. The straight-flow cat design allows much better flow than the stock cats, giving a significant horsepower and torque gain and a throaty sound. Removing the very restrictive primary cats results in a 25hp gain! Supersprint metallic sport catalytic converters are sourced from HJS of Germany. For 30 years HJS has been supplying motorsports teams with sport cats when rules required them. HJS is now a worldwide leader in sport cat technology and performance. Rally cars, German DTM, and Formula 3 all rely on HJS for clean, reliable horsepower. Supersprint works closely with HJS to spec a catalytic converter that is correct for the vehicle and engine package. This allows for a substantial increase in flow but which, at the same time, keeps the environmental specs within European limits. With any high-flow catalytic converter, special software or other work may be required to keep emissions fault codes and check engine lights from displaying. Supersprint catalytic converters are sold for track and other off-road uses only. Fitment Note: These sport cats were designed to be used only with the Supersprint section 2 x-pipe (p/n 980713) and Supersprint rear mufflers. Custom fabrication by an exhaust professional will be required to use these without the Supersprint exhaust sections. These cats include post-cat O2 sensor ports allowing for a complete installation by extending your original post-cat O2 sensors to the new location. Special Race software or module may still be required to keep the SES light and fault codes from appearing.